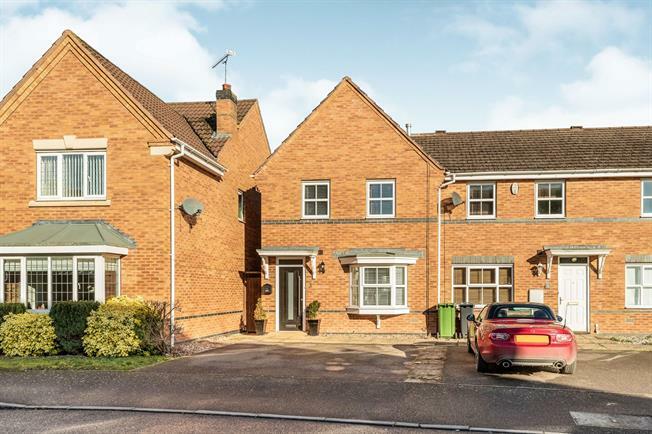 3 Bedroom End of Terrace House For Sale in Warwick for Guide Price £290,000. Newly fitted uPVC front door opening onto the driveway. Radiator, laminate flooring and ceiling light. Double glazed bay window facing the front. Laminate flooring and spotlights. A range of built in wall and base units with granite effect work surfaces over. Inset one and a half bowl sink with drainer. Integrated four ring gas hob with overhead extractor. Space for dishwasher, washing machine and fridge freezer. Double glazed uPVC window overlooking the back garden. Tiled flooring, radiator and spotlights. Newly fitted double glazed French doors opening out onto the patio. Laminate flooring and ceiling light. Low level WC and wall mounted sink with tiled splashbacks. Vinyl flooring, radiator and extractor fan. Double bedroom with double glazed uPVC window facing the rear. Radiator and ceiling light. Extended to fit a double walk in shower the en-suite has a low level WC and pedestal sink. Part tiled walls and vinyl flooring. Double glazed uPVC window. Heated towel rail, extractor fan, shaving point and ceiling light. Newly fitted bathroom with low level WC, pedestal sink with mixer tap and panelled bath with shower over. Part tiled walls and tile effect vinyl flooring. Heated towel rail, extractor fan and ceiling light. Double bedroom with double glazed uPVC window facing the front. Radiator, laminate flooring and ceiling light. Access to the loft via a newly fitted loft ladder. Double glazed uPVC window facing the side. Ceiling light. Single bedroom. Double glazed uPVC window facing the front. Radiator and ceiling light. Parking for two cars and side access to the back of the property. Fenced to three sides the garden is laid with astro turf for easy maintenance. Patio area to the front.